Abstract: Acupuncture and positive results in a chronic KCS case. 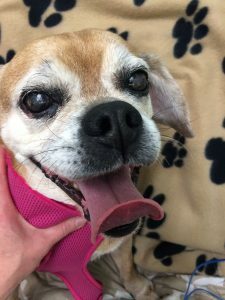 History and Presentation: Lilly is a 12-year-old FS Beagle/Pug mix with a 6.5-year history of bilateral keratoconjuctiva sicca. She has been treated with Steroid-containing eye ointments, Cycylosporine, tacrolimus and artificial tears with minimal changes. Physical Examination and Clinical Assessments: Chronic KCS evident with corneal pigmentation OU, with a raised, non-staining corneal defect present OS (resembling a scab). Blepharitis present OU. Currently using tribiotic ointment BID OS and tribiotic/dex drops BID OD and artificial tears q24hrs. Rest of PE: H/L WNL, BCS 4/5, otherwise unremarkable. Medical Decision Making: Due to the chronicity of the KCS and the minimal response to prior treatments, two options were presented to the owner. Referral to an ophthalmologist or Acupuncture. 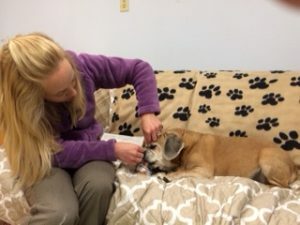 The owner elected acupuncture and was made aware of case study. Acupuncture Treatments: Every treatment: Bilateral: BL 2, BL 10, TH 23, GB 1, GB 14; GV 20, GV 14, Bai Hui. LR 3 – ST 36 with e-stim one treatment; TH 10-TH 14 with e-stim 4 treatments; Deltoid and Trapezius trigger points as myofascial palpation indicated. Initially, 0.16x15mm Seirin’s were used for facial points and 0.20x30mm used for all other points. Korean hand needles were then purchased and used with greater success on the facial points and Hwato 0.20x23mm used for the e-stim points. Acupuncture was performed twice weekly. Outcomes, Discussions, and References: A STT was performed three weeks after the 2x weekly treatments began, with no tear production. At this stage, I was unsure if we were seeing benefit. 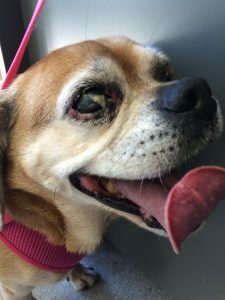 However, 4 weeks into treatment, the corneas lost their thick mucoid discharge and the “scab” disappeared. A glossy appearance reappeared to the corneas and the owner reported increased vision. The general inflammatory state of the eyes and related structures seemed diminished.